MARION: In-diana Jones. Always knew someday you'd come walkin' back through my door. I never doubted that - something made it inevitable. So what are you doing in Nepal? INDY: (Never for a minute seeing it coming, he turns away while she winds up.) I need one of the pieces your father collected. MARION: I was a child! I was in love! It was wrong and you knew it! MARION: Now I do! This is my place! GET OUT! I love her from the moment she drank that big Mongolian guy under the table. Her opening encounter with Indiana Jones in Raiders of the Lost Ark is one of the great scenes in one of the greatest movies ever made. When the bad guys blew up her truck, I grieved like nobody's business. When she turned up alive later on, I was happy as a clam. "It's not the years, it's the mileage." When Indy fell asleep before she could get what she'd been missing for 10 years, I laughed, but I was as frustrated as she was. When she walked off with him to buy him a drink at the end of the film, I couldn't wait to see her in the inevitable sequel. When she wasn't IN the inevitable sequel, or the one after that, I ached. They were good rides - Indiana Jones is the greatest action hero of them all - but Indiana Jones without Marion Ravenwood is like a Reuben sandwich without sauerkraut. So when, at the end of a clip from Comic-Con about the long-awaited fourth Indy movie that Wally Conger tossed up on his blog, Harrison Ford and Steven Spielberg introduced Karen Allen, it was like being in that tent again - Marion is alive! And she's going to be in the next movie!! All of a sudden, instead of having a passing interest and knowing that I'd be there when Indy 4 arrives next year, I HAVE TO SEE THIS MOVIE. Why isn't it Memorial Day 2008 yet? How do I get tickets? Oh, well. I've waited 25 years to see Indy and Marion live happily ever after. I guess one more year is OK. I have become just enchanted with a movie called Joyeux Noel, the story of Christmas Eve 1914 on the front lines of the newly declared Great War, now known as World War I. Taking the true story of how soldiers on both sides of the line climbed out of their trenches and shared some holiday joy together, the film weaves a story around a farm where German soldiers are settled in against French and Scottish soldiers - and where a Prussian opera star takes advantage of a chance to spent an evening with her opera-star lover on the German line. In the aftermath of a truly wondrous series of encounters, the soldiers on both lines are inevitably punished for fraternizing with the enemy - but the film gives you a strong sense that almost all of the men involved are better for the experience and with no regrets. They are betrayed by their letters home, which inevitably pass through censors, who read, among other messages, "We and the British decided to accept the Krauts' invitation. We'll go spend New Year's Eve with them. We'll sing that song the Scots taught us, and above all, drink to the health of all those bastards who, sitting pretty, sent us here to slug it out." A worthy toast! This is a gentle movie that shows how stupid and useless a thing war is, without great quantities of blood and guts, simply by showing normal men talking and singing and interacting with each other. It's an achingly brilliant movie that should warm the heart of people who renounce the initiation of force. The more this movie sinks in, the more I love it. I'm tentatively pleased to hear that the big-screen adaptation of the groundbreaking comic book miniseries Watchmen is not only on track, but the cast is selected and filming will soon get under way under the directing eye of Zack Snyder, who most recently directed 300, which you may recall left me underwhelmed. Still, 300 was a compellingly made film that I had to respect even though I didn't buy that it was an illustration of "real manhood" or "fighting for freedom." The guy could make a damn good Watchmen movie, I think. We'll see. I also see by the dates on some of these links that I'm probably the last guy on Earth who cares to have heard about this. Oh well, at least I haven't missed the opening day. Recent news from the circuses (as in "bread and ...") has been a bit troubling. Most shocking of all are charges quarterback Michael Vick has been neck-deep in the world of dogfighting, including the destruction of underperforming dogs "by drowning, shooting, hanging and electrocution." Much tongue-clucking and teeth-gnashing has ensued over whether to suspend Vick from his job. It seems a no-brainer that the man should be suspended from free interaction with civilized human beings, but the guy's a star, after all, doncha know. Then there's the fuss over whether Barry Bonds' feat of breaking the major league baseball home-run record should be recognized as legitimate or tagged with an asterisk because Bonds shows all the signs of being a steroid abuser. I was on board with believing Bonds was a fraud and a cheat and that Hank Aaron should continue to be considered the all-time champ; then someone reminded me that many pitchers also abused steroids, so perhaps Bonds did accomplish something by being able to connect so successfully against Franken-pitchers. Maybe every record set during the "steroids? moi?" era should be marked with an asterisk. Finally there's the brouhaha over an NBA referee who bet on games, including games he worked, meaning he was in position to affect the final score. I have long ago lost interest in a basketball league that outlaws zone defense, insists on a shot every 24 seconds and discourages enforcement of the rule against traveling - not to mention a winter sport league that extends its season into June. A referee who cheats does call the integrity of the sport into question - but what the NBA markets is not exactly basketball as I understand it as a rabid college BKB fan. My humble opinion is that I don't care enough about the NBA to have an opinion - and as the legion of fans like me grows, that is the league's real problem. We missed 'em at the movies but caught up with Clint Eastwood's dual Iwo Jima movies this week thanks to the miracle of Netflix. Flags of Our Fathers is a fairly interesting jaunt into the story of the legendary photo of the U.S. flag being raised at Mount Suribachi. The reality doesn't quite match the legend, and the movie does a nice job of showing the difference - too nice, perhaps. Scenes of a war bonds fund-raising drive built around the famous picture are jarringly intercut with graphically violent flashbacks of the 35-day battle for the strategically important rock in the Pacific Ocean. It was almost as if director Eastwood were trying to present the visual equivalent of post-traumatic stress syndrome, the way a loud noise in a states-side scene triggers a flash cut to a pitched battle scene on the island. It wasn't easy to watch at times, and in the end the best thing about the film was how it set a context for the far superior Letters From Iwo Jima. So often in "action" flicks, the enemy is simply a cardboard cutout for the hero to have something to shoot at. The value of these two movies is that they stand on their own as viewing experiences, but they intersect at several key places so that you gain an understanding of what the same incidents meant to both the U.S. and Japanese sides. Letters From Iwo Jima puts a very human face on the cardboard cutouts in the companion film. In fact, the first 44 minutes is spent meeting the Japanese men who fought on the island, seeing how they prepared militarily and emotionally for the inevitable battle. As a result, when the graphic violence comes, it is part of the story rather than jarring and gratuitous, as it seemed in Flags. Seeing the films on consecutive nights is an interesting intellectual exercise, and each gains something in comparison with the other. For example, when the Americans land, the Japanese hold their fire until the beach is swarming with troops, and the result is a one-sided bloodbath that gives the Japanese a victory in the first skirmish for the island. In one movie the scene is suspenseful for its mystery - what are they waiting for? - and in the other for the tension between the troops' desire to start shooting and the general's insistence to hold fire as long as possible. Together, the two films are a powerful story about war and the individuals who are forced to wage it. Each film can stand alone as well, and I have no doubt that Letters From Iwo Jima will be the one that lingers longer. It's not that Flags of Our Fathers is a bad movie - it's that Letters From Iwo Jima is a masterpiece, so Flags suffers in the comparison. I can't stop thinking about this since I heard about the earthquake Monday that shook Japan and caused concerns about radioactive leaks. Many of my usual suspects are not writing much lately, but hey, neither am I. What's up with this? I suppose I could blame a Carteresque malaise - folks not able to cope with the overbearing acceptance of the contemporary land of the not-free and home of the slave. However, ever the optimist that free men and women will refuse to be afraid and continually free themselves, I choose to believe we are merely taking advantage of a beautiful summer, tending to gardens, loving our loved ones, and playing with puppies and cats. That's what I've been doing, at least. Oh sure, I feel as oppressed as ever and confused by how easily Big Brother weaseled his way into our lives ... but mostly I'm sedated by the cat that makes himself comfortable in my lap while I type, the sunshine that beckons me from the basement, and the sweetie who likes my company. And so I presume my fellow blogistas are in similar condition. I cherish their occasional appearances, appreciate those who are still being prolific, and looking forward to writing down some of the thoughts I've been thinking while feeding the birds, maintaining my path through our woods, and thinking of ways to protect the patch of wild St. John's wort we found the other day. With Pope Benedict XVI's blessing, the Vatican released a document Tuesday that said the Catholic Church is the one true church and other Christian bodies shouldn't be called churches. With religious wars and jihads all over the world, what we need is to set Christians against Christians. Christians who don't accept the elected-by-men pope as Christ's one true representative on Earth, successor to Peter, are not real Christians in this guy's mind. When a person starts declaring who's a real Christian and who's not, it seems to me he's losing sight of what Christ was trying to tell us all. It's nothing new for a man to lose track of the way, the truth and the light -- just a little unusual in someone who's been declared infallible. An old Protestant pastor friend of mine once told me God trusted his message with the Catholic church for about 1,600 years, so they must be doing something right. John Paul II struck me a someone deserving of respect. Benedict XVI just undid almost 30 years of John Paul's healing efforts. There seems to be some steeling of will going on in the section of the blogosphere I regularly cruise. Sunni has embarked on a mysterious adventure and paused long enough to send a message that includes, among other observations: "Many times when a person says "I can't," what is meant is "I won't." Claire, meanwhile, says she is wrestling with decisions, and the "impractical" choice seems to be winning her soul. And she writes that it calls to her, "Go for it. Damn the caution. Damn the consequences. Life will provide." They seem to be in the process of going for it, whatever "it" may be in their lives. I, too, have my share of choices, and the easy one is the status quo. But it leaves a lingering sense of uneasiness. Should I go for it, too? Problem is, I can't decide which "it" to go for. Or perhaps, as Sunni wisely notes, I won't. The comment under the link in the Foundation for Economic Education's daily briefing sums it up: "This is embarrassing." The American state of Minnesota has announced that all US flags sold in the state should be of American manufacture, and warned violaters of the law, that they would be punished by a 1,000 dollar fine, or imprisoned for three months. The law is expected to be passed by the end of the year, reports The Times. Just in time for Independence Day, Uncle Warren has come down from the attic with his first podcast in a while, and I think it's a doozy. He tosses in his short story about property rights, "Wildflower Man," and a dramatic reading of Patrick Henry's "Give me liberty" speech in between the usual tasty musical selections. I've heard that word "eclectic" used for this show, and it fits again. I have an unusual relationship with UW, and he doesn't like it much when I blow his horn, but this one might deserve a little extra attention. You can find it here or here or here. The last several CG-animated films I've seen have left me cold or semi-cold. The Shrek movies, OK; Ice Age 2 and Cars, kind of boring; Happy Feet, downright incoherent. 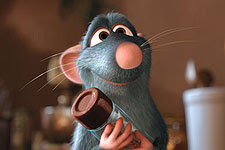 But the Pixar folks charmed the pants off me just about every time before laying an egg with Cars, so I went into Ratatouille with hopeful, but low, expectations. After all, they did disappoint me with the faux NASCAR thing, so I've been thinking maybe they've run their course, and we'd again never see a night of animated entertainment as fun as Toy Story 2 or Monsters Inc. or A Bug's Life. Silly me.